VietNamNet Bridge – Tropical Storm Jebi has claimed the lives of six people after making landfall in the northern Viet Nam early on Saturday. 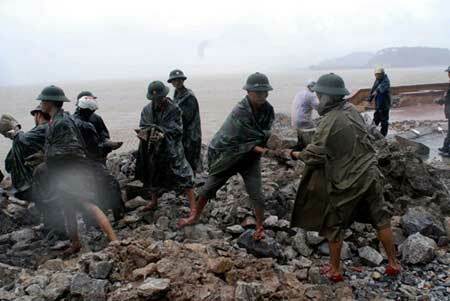 Local soldiers reinforce a stretch of dyke in northern Hai Phong City's Do Son District to cope with Storm Jebi. The storm made landfall in Viet Nam on Saturday morning. Eleven others were injured and hundreds of homes were damaged by the fifth tropical storm to hit the country this year. Quang Ninh was one of the hardest hit provinces, with two dead, three injured, and two antenna masts and 14 electric poles toppled. More than 320 houses and 200 hectares of crops were also damaged. According to the Steering Committee for Flood and Storm Prevention and Control and the National Committee on Search and Rescue, the storm cost Quang Ninh around VND10 billion (US$476,000) in damages. Three people were also killed in Hoa Binh Province and one in Bac Kan Province as the storm swept through the northern region. The storm battered hundreds of houses, flooded thousands of hectares of crops and damaged major infrastructural facilities in northern localities. The storm also caused a power cut on Cat Hai Island in the northern port city of Hai Phong, but the area was evacuated on time. According to the National Centre for Hydro-meteorological Forecasting, water levels in rivers were rising rapidly, which could cause further flooding. The Steering Committee for Flood and Storm Prevention and Control has asked northern and midland provinces to keep an eye on weather patterns and take prompt action where necessary. Typhoon Jebi also caused delays, cancellations, and diversion of flights in Ha Noi and Hai Phong on Saturday. According to Viet Nam Airlines, 44 of its domestic and international flights were cancelled on Saturday, 32 of them to or from Ha Noi's Noi Bai International Airport and 10 flights at Hai Phong's Cat Bi Airport. Two flights between Luang Prabang in Laos and Siem Reap in Cambodia operated by the carrier were also affected. Budget airline Vietjet Air also cancelled four flights between HCM City and Hai Phong, and was considering whether to cancel some Ha Noi services. The other low-cost carrier, Jetstar Pacific, announced that the flight between HCM City and Hai Phong would instead be diverted to Ha Noi, and passengers would be ferried by bus to the coastal city free of charge. The three airlines requested their passengers not to go to the airports but instead check their websites or contact ticket agents for information about schedules.